Julia Child has been on my mind of late, and not just because of the newly released movie, Julie and Julia, but also because I have a real connection to this culinary icon. Julia was my first adviser when I started my career in public television and launched Ciao Italia. 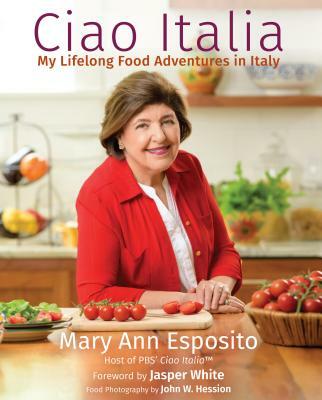 I remember the day I picked up the phone to ask her how I should proceed with a television program all about Italian food. Her fever pitched voice came resonating over the phone as she said, "Deary, get a good lawyer!" And without missing a beat, she added, "When are you coming down for lunch?" I stayed in touch with Julia over the years at culinary events, dinners at friends' houses, and seminars that we both attended. I always remembered to send her a birthday card because both of our birthdays were in August. One year, when Julia was vacationing in Maine with her niece and nephew, I invited her to stop by the studio while we were in production. I remembered that it was her birthday, so I told the staff that I wanted to make her a cake. Imagine, me making the queen of baking St. Honore's a cake! But this was going to be an Italian cake, not a French one, so I whipped up a pan di spagna (sponge cake), and filled it with pistachio cream. When Julia arrived, we presented her with the cake, and sang "Happy Birthday". But there was still a small segment to shoot, and the subject was frittata, or what Julia called an omelette. Julia sat on a stool and provided the commentary as I whipped the eggs and made the frittata. When it was cooked, I offered a sample to her and asked if it needed anything, like salt or pepper. Once again, her quick wit caught me off guard. "More bourbon!" she pronounced. Buon Appetito! For the cake, preheat the oven to 350 degrees Farenheit. Butter a jelly roll pan and set aside. Dust a clean kitchen towel with confectioners' sugar and set aside. Beat the egg yolks with sugar in a large bowl until light and fluffy, then beat in the butter. Set aside. In another bowl, whip the egg whites until soft peaks form. Sift the flour, baking powder, and salt together. Sprinkle the flour mixture a little at a time over the egg whites and gently fold them in with a rubber spatula. Fold the egg white batter into the egg yolk batter, along with the lemon zest. Spread the batter on the jelly roll pan and bak for 10-15 minutes or just until the top and edges are nicely browned and the cake springs back when touched with your finger. Turn the pan over onto the towel lightly dusted with confectioners' sugar. Starting at the short end of the cake, roll it up gently in the towel and let cool. For the pistacio cream filling, grind the nuts and 1/2 cup of the sugar until powdery in a food processor or wiht a mortar and pestle. In a saucepan off the heat, beat the egg yolks with the remaining sugar until the mixture is lemon colored, then beat in the flour. Slowly stir in the milk. Cook the misture over medium high heat until it thickens and coats the back of a spoon. Remove the mixture from the heat, and stir in the pistachio and sugar mixture. Transfer the pistachio cream to a bowl and cover the top with a piece of buttered wax paper. Refrigerate for at least one hour. Line a 2-quart bowl with plastic wrap, allowing excess to hang over the edges of the bowl. Unroll the cake and spread it with the amarena cherry filling; then carefully spread a thin layer of the pistachio cream over the cherry filling. Re-roll the cake, wrap it in plastic wrap and refrigerate for one hour. Using a serrated knife, cut the cake into 1/2 inch slices. Place a few slices in the bottom of the bowl and cover wiht a layer of pastry cream. Add another layer of cake, positioning the layers against the inside walls of the bowl and add more pastry cream. Be sure to put a few pieces of cake in the center as you layer filling and cake. The top layer should be cake. Fold the overhanging plastic wrap over the cake and refrigerate until ready to serve. In a bowl, whip the cream with the Alkermes and sugar until stiff. Turn the bowl over to un-mold the cake onto a decorative serving dish. Remove the plastic wrap and discard. Fit a large pastry bag with a #2 star tip. Fill the bag with the whipped cream and pipe a decorative border around the base of the cake and at the top if desired. Cut into wedges to serve.